Eugene Bozza is not a particularly well known composer outside of his native France, though his output was large with significant amounts of wind chamber music alongside five symphonies, operas, ballets and more. Born in Nice to an Italian violinist father and a French mother, he trained at the Accademia di Santa Cecilia in Rome, and at the Paris Conservatoire with Henri Busser (in fact his third period of study at the conservatoire having previously studied violin and then conducting). He won the Prix de Rome in 1934. From 1950 he was director of the Ecole Nationale de Musique in Valenciennes and it is during this period that, in 1956, he wrote Le chant de la mine; technically an oratorio, the work uses a spoken narration with text by the Belgian poet Jose Bruyr and the two regarded themselves as co-creators of the piece. Eugene Bozza's Le chant de la mine was premiered in 1956 and not heard since, until the performance in Valenciennes in 2018 which forms the basis for this recording on the IndeSens label from the Orchestre Valentiana, conductor Nicolas Bucher, with soloists Zoe Gosset, Sarah Laulan, Sebastien Obrecht and Daniel Ottevaere, and narrator Didier Kerckaert. Thanks to its coal, in the 19th century Valenciennes became a great industrial centre and the captial of France's Northern steel industry. 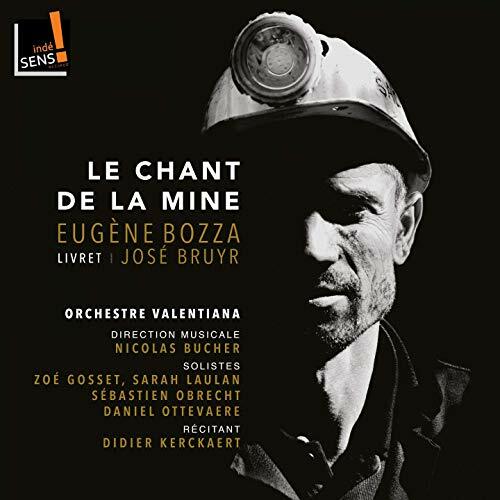 It is this which is captured in Le chant de la mine, the piece tells the story of one day at a mine, a day not without tragedy. Bozza's music is full of references to French 20th century music and there are passages where Ravel and Debussy are clear influences. But it is the use of the spoken text and melodrama which gives the pieces its distinctive form and makes you think of a complex work like Honegger's Joan of Arc. And it is not just the long and complex role of narrator, here taken by Didier Kerckaert who is a member of the Comedie Francaise. The chorus also uses rhythmic speaking and chanting.